We all know we have both positive and negative emotions. As soon as we hear the words love, kindness, generosity we know they are the positive ones, and when we hear about hate, anger, jealousy, and depression, we know they are the miserable ones. The Buddhist point of view is that we can change our minds. We can come to know ourselves well, look into our minds, and become deeply familiar with what’s there. The most practical reason for wanting to do this job is, first of all, because it will make us more happy – and we know we want to be happy! And second, it’ll make it easier to live with other people. Normally we either suppress our disturbing emotions, or we get caught up in them and act them out, sometimes hurting others. The Buddhist approach is a middle way between these two: acknowledging our emotions and working on them, trying to transform our mind from negative to positive. Sometimes our mind is like a thick jungle of disturbing thoughts and emotions, and it’s hard to really see what’s going on. With mindfulness, honesty, and discriminating intelligence we can start to identify what’s what: “That’s anger; that’s desire; that’s fear;” and so on. Once we know what we’re up against, we can choose the appropriate methods to work on them. Attitudes to avoid include guilt, self-hatred, and self-judgment. Also, we need to stop identifying with the emotion, for example, thinking “I am my anger,” which leads us to be obsessed and act it out. We can avoid these by remembering that delusions are impermanent, coming and going in our mind like clouds in the sky, and that they are not our true nature. According to Buddha, the real nature of our mind is pure, free of delusions, like a clear, cloudless sky. And we can learn to think, “Anger is in my mind” or “Depression is in my mind,” which helps us to deidentify with the emotion. If there are a number of different emotions disturbing your mind at the same time, it’s best to start with the one that is strongest and most troublesome – don’t try to take them all on at once! Once you’ve managed to get the biggest one a bit more under control, then you can move on to the next biggest. When we can be aware of the arising of an emotion such as anger in our mind, we can control and deal with it more effectively. We may sometimes be able to simply let it go. Also, through regular practice of meditation, our mind will be more calm, less likely to react emotionally to situations. The mind is clear and non-physical; it is a stream of mental events that rise and pass away. These mental events – thoughts, emotions, etc. – are impermanent: they appear and disappear, come and go; they are not permanent, fixed entities. It can be useful to think of them as being like clouds that come and go in the sky, or like dreams, rainbows, or waves that rise and fall in the sea. 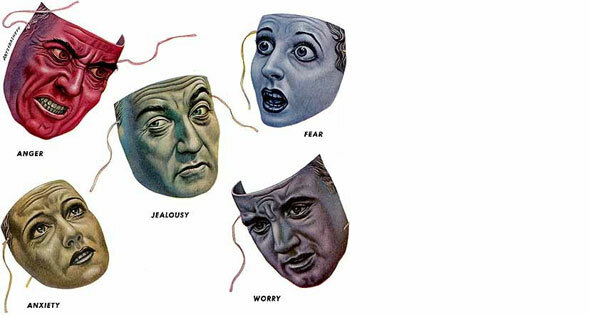 And, as mentioned above, it is helpful to learn to de-identify with the emotions: e.g. instead of thinking “I am angry,” think “anger is in my mind”—this gives the emotion less power over us, and we can deal with it more objectively. We like certain thoughts and emotions, and dislike others. This leads to attachment/ grasping, and aversion/rejection. When our mind is caught up in attachment and aversion, it isn’t peaceful. Instead of this, it’s better to cultivate a sense of equanimity: a non-judgmental, loving awareness and acceptance of whatever arises in the mind. Investigate the sense of “I” that lies behind the emotion. Is it something real, existing on its own, from its own side? Can you locate it in your body or mind? What exactly is it? We can also examine the object we are feeling emotional about – does it really exist in the way it appears to us, or is it possible that we might be perceiving it in a distorted, mistaken way? When we are experiencing an emotional problem, we tend to get obsessed with it as if we were the only person in the universe who had such a problem. This is clearly not the case, and thinking this way makes the problem seem worse than it really is. So it’s useful to remind ourselves that there are many other people who have the same or a similar problem, and some have it to an even greater degree than we do. This makes the problem seem more like a molehill rather than a mountain, so it’s easier to bear, and it also helps us to become more compassionate towards others. 1. Contemplate the faults or disadvantages of anger, so that you become convinced that it’s harmful rather than helpful, and therefore not something you want to indulge in. First of all, look at the immediate effects anger on your mind and body. What is it like being angry? Is your mind peaceful and happy, or disturbed and discontent? Are you able to think clearly and make intelligent decisions, or does your thinking become confused and irrational? And how does it affect your body? Do you feel calm and relaxed, or agitated and tense? Scientific studies have shown that anger is a significant cause of certain health problems, such as heart disease and cancer, as well as of premature death. to the cultivation of positive qualities such as love, compassion and wisdom, and to making progress on the spiritual path. 2. Cultivate loving-kindness. This can be achieved by reflecting on thoughts such as “May all beings be well and happy.” Becoming familiar with, and filling our minds with, lovingkindness, will naturally decrease our anger. 3. Remember karma, cause and effect. If someone harms you in some way—by being abusive or unfriendly, cheating or stealing from you, or wrecking your belongings—and it seems you have done nothing to deserve it, check again. According to Buddhism, any misfortune that comes our way is the result of harmful actions we created in the past—in this or other lives. We reap what we have sown. When we can see our problems in this light, we will be better able to accept and take responsibility for them rather than dump the blame on others. Also, if we understand that getting angry and retaliating will just bring us more problems in the future, we’ll resolve to be more patient, and more careful about the karma we create. 4. Put yourself in the other person’s place; try to see the situation from their point of view. What is driving them to behave this way? Is their state of mind peaceful and happy, or confused, miserable and uncontrolled? They are human like you, with problems and worries, trying to be happy, making the best of life. Recall your own experiences of being angry and unkind to get a better idea of what they are going through. Also, consider that if they continue to act in deluded ways, what will the outcome be? Will they be happy and satisfied, or are they just creating more trouble and suffering for themselves? If we really understand others’ confusion and pain, we’ll be less likely to react with anger— which would just give them even more suffering—and more likely to regard them with compassion. 5. Consider that the person you’re angry at is like a mirror. Check: what is it that you dislike or feel angry at in the other person? Then ask yourself: “is this something that I have in myself?” The idea here is that what we dislike in others is something we dislike in ourselves; the solution is to become more accepting, less judgmental towards our own faults. 6. Anger is more likely to arise in our mind when we are unhappy or dissatisfied. If you notice yourself getting irritated and angry by even small things, sit down and check what’s going on in the deeper levels of your mind. If you notice that there are unhappy, critical, negative thoughts, you can put those aside and focus on positive things about yourself, your life, etc. and that it leads to dissatisfaction and unhappiness. And making a habit of it leaves imprints on our mindstream to experience more problems in the future. Attachment clouds the mind and prevents us from recognizing its faults. It is very important to be honest with ourselves, to penetrate its façade and analyze its real nature. 2. Recall that all things are impermanent. By their nature they change from moment to moment and will inevitably perish. The object of your attachment will not always be attractive and pleasing; visualize it as old, faded and worn and then check if your feelings about it remain the same. And how would you feel if you lost it altogether? The pleasure you experience is impermanent, too. For how long do you really feel pleased and satisfied with any one object? When we recognize that external things cannot give us lasting happiness and satisfaction, our attachment to them will lesson—and we’ll probably enjoy them all the more! maintenance, worries, etc. involved in owning such a car. Or, if you feel attracted towards someone and think, “If I could have a relationship with that person, it would be so wonderful!” remind yourself that the person may have faults you don’t see right now, or that you might run into conflicts later on. But be careful not to go to the other extreme and develop aversion for the object! 1. Look at your fear. Sit down and make your mind calm with some breathing meditation. Then allow the fear to come into the clear spaciousness of your mind. Don’t let yourself get caught up in it, but stand back and examine it objectively. Ask yourself what exactly is it that you are afraid of? Then ask yourself: Is it reasonable for me to have this fear? Is it likely that what I’m afraid of will actually happen, or is my mind getting carried away with highly unrealistic fantasies? If it is possible that it will happen, then is there anything you can do to prevent or avoid it?….If so, decide to do it, and stop worrying! If there’s nothing you can do, or even if you try to prevent it, it might happen anyway, then are there things you can do to prepare yourself for that? …. Think of other people who have been through that experience. See if you can draw strength from that awareness: if they could do it, so can I.
It’s good to keep in mind the advice of the great Indian master Shantideva: “Why be unhappy (or worried) about something if it can be remedied? And what is the use of being unhappy (or worried) about something if it cannot be remedied?” In other words, if there’s nothing that can be done to prevent or remedy an unwanted situation, it’s useless to worry; better to just accept it! 2. If you are afraid of change, loss or death, you can meditate on impermanence and death. Familiarizing ourselves with the reality of how we, others, and the things in the world around us are changing all the time and will eventually disappear enables us gradually to become more accepting and less fearful. concern for others leaves little or no space for egotistical worries like “will they like me?” or “what will happen to me?”, so the communication will probably be more successful and satisfying. 1. Learn to rejoice: this means feeling joy and admiration for the virtues, good actions, good qualities and happiness of others. By doing this, our mind is happy, and we create a great deal of merit. Kathleen McDonald (sangyewas born in California in 1952, and took her first courses in Buddhism in Dharamsala, India in 1973. She was ordained as a Buddhist nun in Kopan Monastery, Nepal, in 1974. She has studied Buddhism with various teachers such as Lama Zopa Rinpoche, Lama Thubten Yeshe, His Holiness the Dalai Lama, Geshe Ngawang Dhargyey and Geshe Jampa Tegchog, and in various countries such as India, Nepal, England, France, and Australia. At the request of her teachers Ven Sangye Khadro began teaching in 1979, while living in England, and since then has taught in many countries around the world. She was a resident teacher in Amitabha Buddhist Centre in Singapore for 11 years. In 1988 Sangye Khadro took the full ordination, or bhikshuni, vows. She is the author of How to Meditate and Awakening the Kind Heart, and co-author, with Lama Zopa Rinpoche, of Wholesome Fear, all from Wisdom Publications. Since 2009 she has been following the seven-year Masters Program at Lama Tsongkhapa Institute in Italy. 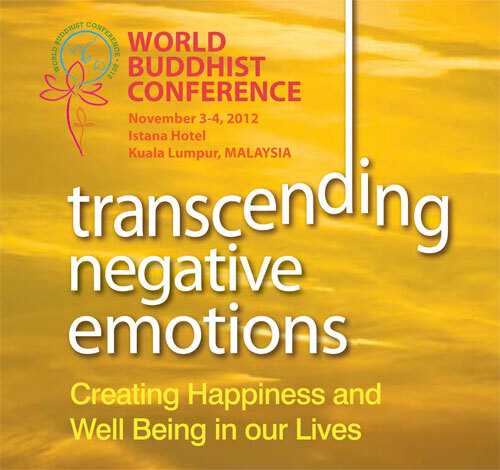 She was in Kuala Lumpur for a series of teachings in July 2013 at the invitation of the Buddhist Gem Fellowship.